Igor Kenk, the infamous Toronto bike thief, could soon be a free man. Kenk was sentenced to 30 months in jail at Old City Hall court today, but due to pre-trial custody time, he faces just four more months in jail. 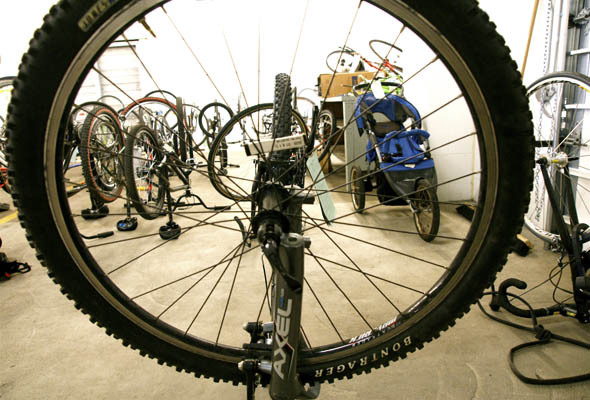 Kenk, 50, who stood accused of masterminding the theft of almost 3,000 bicycles in Toronto, pleaded guilty to just 10 counts of possession of stolen property (10 bikes worth under $5,000), as well as five counts of possession of cocaine and one count of possession of marijuana. To keep the case manageable, Kenk faced only 58 charges relating to bike theft and 22 charges relating to drugs. The remaining charges were dropped, as reported this afternoon. I personally witnessed one of the discovered stashes of bikes in a rented Parkdale garage in July 2008. The subsequent effort by Toronto police to return the stolen bicycles to their rightful owners, saw 582 bikes reclaimed. The fate of the remaining unclaimed bikes, collected in the raids of other Toronto garages and in Kenk's Queen St. W. bike shop, is yet to be determined. Charges against Kenk's common-law wife Jeanie Chung were also dropped, as part of today's plea bargain. Chung, a classical pianist, also faced charges relating to stolen property and drugs that were found in their Yorkville home. Kenk still has to face assault charges, stemming from an incident in December 2008 where he allegedly swung a metal pipe at the owners of a garage he rented. Do you think that this sentence is fair? What message does this send to would-be bike thieves and the future safety of parked bicycles on the streets of Toronto?